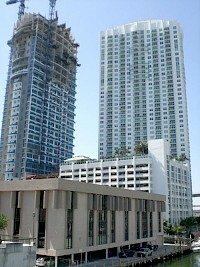 Avenue on Brickell is a residential high-rise complex in the Brickell district of Miami, Florida. The project consists of two high-rise residential towers, Avenue on Brickell East Tower and Avenue on Brickell West Tower. Both towers were topped off in early 2007, and were structurally completed in late 2007. Avenue East Tower, the taller of the two buildings, stands at 480 feet (146 meters), with 47 floors and its entrance is on Brickell Avenue. The Miami Tower is a 47-story, landmark office skyscraper in the city of Miami, Florida, United States. It is located in central Downtown. It is currently the 8th tallest building in Miami and Florida. Built for CenTrust Savings & Loan in 1987, the 47-story building ranks in the top ten tallest skyscrapers in Miami and in Florida at a height of 625 feet (191 m) and is known for its elaborate night-time illuminations and its dramatic three glass tiers. Blue on the Bay is a skyscraper in the City of Miami, Florida, United States. 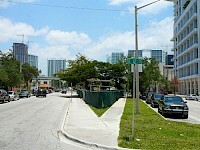 It is located in the northern part of the city, near Midtown Miami, in the Edgewater neighborhood. 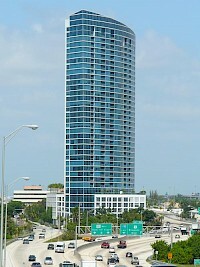 Completed in 2005, it was part of the recent building boom in Miami. It is 425 feet (130 m) tall, and contains 37 floors. Floors 1-3 are used for retail, and floors 4-36 are used for residential units. 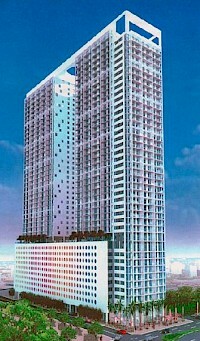 The 37th floor contains an observation deck and resident facilities. The Brickell Financial Center is an under construction skyscraper office complex in the City of Miami, Florida, United States. It is located in Downtown's northern Brickell Financial District, on the corner of Brickell Avenue and Southeast 7th Street. The complex contains the state of Florida's first building to be pre-certified under the U.S. Green Building Council's Leadership in Energy and Environmental Design (LEED). It includes office space, a hotel, luxury condominiums and a public plaza. 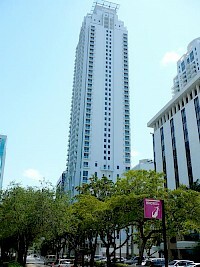 The Brickell Flatiron is a planned skyscraper in downtown Miami, Florida. It has been recently approved by the City of Miami and construction is expected to begin soon. 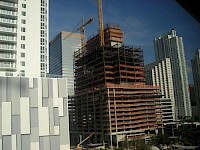 When completed, it will be the 5th tallest building in Miami, at a height of 794 feet (242 m). It will contain 70 floors. The building will be constructed in the triangular lot at the fork where South Miami Avenue and Southeast 1st Avenue diverge in Miami's Brickell Financial District. Brickell on the River is a complex of residential towers in downtown Miami, Florida. The complex consists a 42-story North Tower, which was completed in 2005, a 46-story South Tower built in 2007, and a central plaza between both towers, containing a restaurant, riverfront promenade, and complex amenities. The North Tower took 31 months to build, as construction began in December 2003, and was completed in July 2006. 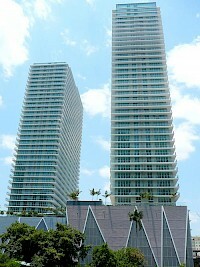 Carbonell Condominium is a residential high-rise building located in the Brickell neighborhood of Miami, Florida. The tower is one of the tallest buildings located on Brickell Key, a small island located due east of Brickell in Biscayne Bay. Standing at 410 feet (125 meters), the building is currently tied with Two Tequesta Point as the 88th-tallest building in the city. 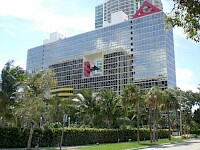 The building's address is 901 Brickell Key Boulevard. Carbonell Condominium houses 40 floors, and was completed in 2005.